I got some good Marvel Heroes time in last night, using the weekly Midtown Madness event to level up Hawkeye and upgrade his uniques. Recently, I’ve been leveling the Invisible Woman and she currently sits in the mid to high 40’s, but for whatever reason she hasn’t really resonated with me in the same way that most of the other heroes have. I like her stealth mechanics, as they are helpful when trying to zip through an area full of trash mobs, but her powers all just seem kind of blah. I think there are a couple of reasons for this. First off, all of her powers are some variation of force field manipulation. That’s cool, but animating different variations of an invisible force field must be pretty challenging. While they all do different things, they just don’t *feel* very different. Developer Brian Waggoner spoke on a recent podcast about the only difference between powers of the same type (ranged, mele, DoT) being the animations for the hero. Maybe I just don’t prefer the force field animations. So, to take advantage of the special XP bonus for Avengers characters (a temporary boost to celebrate the release of Age of Ultron on physical media), I switched back over to my ‘original’ Marvel Hero, Hawkeye. Hawkeye is the hero who I rolled when I first tried the game a few years ago. At the time, he didn’t make much of an impression, but as I’ve discussed before, neither did the game as a whole. Now, however, I’m enjoying all of Hawkeye’s ranged trick shots and pairing him with an Iron Man team-up means a lot of exciting pew-pew! In fact, I’ve enjoyed every Avenger and Guardian of the Galaxy who I’ve tried, which leads me to the 2nd reason that I believe Invisible Woman didn’t fully resonate. I’m a very recent Marvel fan. Unlike most 30 (*cough cough* I mean 40) year olds, I did not come to the fandom via the comic books of the 80’s and 90’s. I was aware of them, and some of my friends were quite the X-Men fans, but I never really recall reading a comic book during that timeframe. So nearly my entire frame of reference for these characters has been via the X-Men and Marvel Cinematic Universe films from recent years. I did watch the 2005 incarnation of The Fantastic Four at some point, but was not impressed and therefore dismissed it from memory. So much so, that I didn’t even remember that Chris Evans was in that movie until recently! In other words, I feel no connection to the Fantastic Four characters. Whereas heroes like Iron Man and Star Lord feel familiar and likeable, Invisible Woman is just a concept to me. She doesn’t feel authentic or three-dimensional. It’s probably a tough balance for Gazillion to strike, trying to appease both the die-hard comic book fans and the relative naive moviegoers like myself. 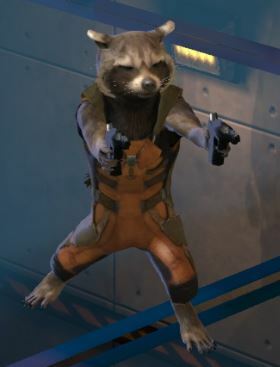 They did a really nice thing with Rocket Raccoon where they designed the original Rocket to look/sound more like the comic book incarnation, but later offered an “enhanced” costume that looks and sounds much more like the movie version. If they did this with all of the characters from MCU, I would probably buy the enhanced costume for every single one of them. To date, I have purchased the MCU costumes for all of the Avengers (even Ant-Man) and Guardians, simply because that’s how I picture those characters in my mind. As far as progress goes, I’m still interested in “gearing up” Iron Man a bit more, especially since more challenging content is still impossible for me to complete (I’m looking at you, Limbo), but I maintain that for me, the real appeal of this game playing, progressing and leveling multiple heroes. It’s just the way I prefer to play. I don’t know if I’ll ever prestige a character, because that style of play just doesn’t sound very fun to me. If I’m going to start the leveling process all over again, I’d prefer to do it with a different set of skills, not re-earning ones that I’ve already earned. That said, who should my next hero be? I’ve been holding some back in order to play with my kids if they ever decide to log back in, but if they don’t get interested I’m going to have to go ahead and play my Avengers to cap and hope that the mysterious mentoring system makes its debut sometime soon! Next Article Car Citizen: Catch the Vision! Have you played Star Lord? It sounds like you might have. I really enjoy him. War Machine was also freakin fun. Also, thanks for the reference to Casual Core Radio!